COLFAX - If farmer Bill Myers loaded a tractor-trailer with wheat and sold it the usual way, to a big grain company on the West Coast, he could expect to collect about $3,000 at today's prices. But when he bags that grain into gallon-sized plastic bags and sells it over the Internet, Myers reaps 20 times that price for the same amount. That's the idea behind this fifth-generation farmer's new business, Joseph's Grainery, selling his farm's whole grains directly to the end user rather than going the traditional route. "This is a little experiment," Myers said one recent cold afternoon inside the big yellow hangar at the Colfax airport where he has set up shop. Inside are an airplane, a tractor and a vintage pickup truck he uses to make deliveries. Stacked neatly against one wall next to a measuring bin are several red, yellow and blue plastic tubs filled with soft white wheat, dark northern spring wheat, lentils and barley. Myers, a 59-year-old farmer with a persistent smile and a ruddy complexion, shows off his wares with a mixture of bubbly, kid-like enthusiasm and subdued, business-like circumspection. "I was just looking on the Internet, looking for soft white wheat market information," Myers said. "The information we get is pretty well canned by the people that buy our commodity. So I was just searching for different information - looking for anything to just get a little different perspective on what the market was doing currently." He typed in "soft white wheat" and up popped a slug of stories about how growers are marketing their products in unusual ways. "This isn't an original idea, by any means," Myers said. "There are lots of people all over the country doing this already. And I thought, 'Well, if those guys can do it, I can try it.' "
Starting with this year's crop, Myers set aside 3,000 bushels of his finest grains - the ones that would be used for seed next spring. And then, with the help of his daughters Kelli and Kendra, who hold degrees from Washington State University in agribusiness and accounting, Myers established a Web site, with teasers directing YouTube viewers to his location. Joseph's Grainery targets people interested in grinding their own flour or incorporating healthier, whole grains into their diets. The Web site assures buyers the grains are not genetically engineered nor have they been treated with pesticides, the way bulk grain is before it reaches the consumer. Myers said his granary also appeals to people who are interested in stockpiling nonperishable foods for emergency situations. "There's a market here for a storing up of emergency supplies, but we don't trumpet that too loud," he said. "It speaks for itself. There's a lot of people in the industry that are geared toward that, so we're not really doing it, but it's not lost on anybody." He draws an analogy to the biblical story in the book of Genesis, where, Joseph, having successfully interpreted Pharaoh's dream of seven surplus years and seven lean ones, guides Egypt into stockpiling its grain against future famines. Myers' customers are not "wild-eyed and crazy" about this concept, he said, but they take the notion seriously. Eating straight out of the field is something most farmers in this area have never tried. Even Myers, who grew up on the farm, said until he began this new marketing prospect he had never tasted the wheat that is raised on his own land. "I've heard stories about the old guys in the Depression days, who said: 'Well, yeah, we'd boil up wheat and eat it for breakfast.' Well, I thought I'd just give it a try and it's good. I can take this stuff and boil it up for breakfast and dump a little brown sugar and raisins on it and that's cheap eats." The Web site provides recipes for the grains Myers sells, including one for applesauce and wheat berry cake that uses a half cup of soft white wheat, cooked and cracked in a food processor; and a beef, barley and mushroom stew recipe that uses two and a half pounds of round steak and a half cup of barley. 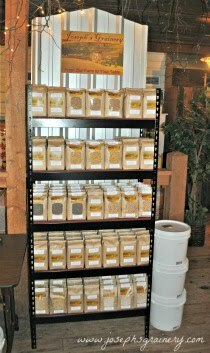 The Web site also tells how to properly cook whole grains and offers gift packs along with anecdotal stories about the Myers' farm and the Palouse region. Since October, when Myers launched the business, he's gradually picked up customers who have perused the Internet sites and then told their friends about it. He has no outsized ambitions that the niche market will replace his customary way of selling grain. But the venture has promise, and Myers admits he's learned more about the food industry than he expected. "It's kind of opened my eyes to the food business because we all know when we go in to buy a box of cereal, that stuff costs around $3.50 to $4 a pound. The cheapest part in that box is the grain. So you're paying a lot more for the printing on the box, the box it comes in, the trucks and trains and everything that's involved. "I think what's going to put us over the top is, it's more a matter of, well, there's an old saying in sales: You don't sell the steak so much as you sell the sizzle. And the whole idea of self-reliance and we're packaging the rural lifestyle. It's kind of a little bit corny, but I think people respond to it. And a lot of people that maybe have come out of rural backgrounds and moved away, it strikes a chord with them and makes them think of home."